A boat strike victim, Charlie’s case was unique; initially the turtle was not moving its rear flippers, which led Gulf World staff to believe that Charlie was going to be permanently paralyzed. Gulf Coast Regional Medical Center* graciously allowed the use of their CT and MRI machines to assist Gulf World veterinary staff in understanding Charlie’s condition. Dr. Staggs, GWMI Veterinarian, found that despite severe trauma to the vertebra, miraculously Charlie recovered movement and feeling of his/her hind flippers. During the rehabilitation process, both western and eastern medicine practices were used to aid in Charlie’ recovery. The therapy regimen included cold laser therapy to reduce inflammation and the use of local beeswax donated by Tupelo Beekeepers Association to heel his carapace (top shell). 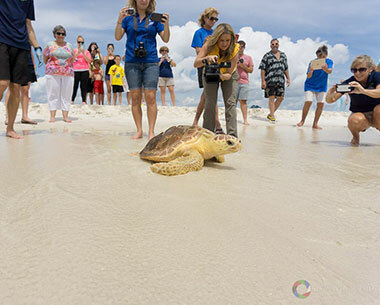 The bone structure of the carapace healed enough that he was medically cleared for release by the Florida Fish and Wildlife Conservation Commission (FWC) after 14 months of rehabilitation at Gulf World Marine Institute. The external carapace will complete the healing process over time just like a human’s wound. *Gulf Coast Regional Medical Center follows all federal, state and local laws to ensure proper cleaning and sterilization of medical equipment for the safety of human patients.